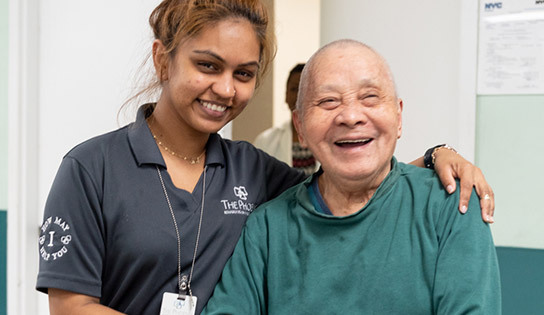 For four decades, The Phoenix Rehabilitation and Nursing Center has been a premier provider of high caliber rehabilitation nursing care. We take pride in having received two awards from the New York State Health Department for our innovative Best Practices, as well as the prestigious American Healthcare Association’s National Quality of Life Award. Situated in the Fort Greene section of Brooklyn, at the crossroads of so many diverse ethnic and religious populations, we are deeply sensitive to the physical, emotional and spiritual well-being of every resident. Our multilingual team of caregivers, fluent in Chinese, Spanish and a variety of regional dialects, are well-equipped to make every patient feel at home. With an expansive Rehabilitation gym, private and semi-private suites featuring fabulous views, and an array of comfort-enhancing services including a daily shuttle to Chinatown, patients can enjoy proactive care in our upbeat, optimistic setting.